That’s my grandmother with my dad’s pet pigeon on her head…really. 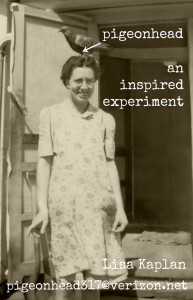 She is the inspiration for pigeonhead, an experiment in all things creative, crafty, and cobbled. Since my grandmother taught me to sew at age 10, I have had a love of crafting with (and collecting) textiles. Alas, as I moved through high school and college, creative pursuits took a back seat to math and science courses, followed by career and family. After many years away, I am ready to scratch that creative itch again. I just want to play and see where my imagination takes me. I love working with vintage items. I try to be “green” by re-using, altering and re-purposing what I have in my stash of stuff…or what I might find while thrifting or at a yard sale. Most of all, I just want to have fun…channeling my silly, wonderful grandmother as I go. Lisa Kaplan lives in Holliston, Massachusetts with her husband, 2 cats and 1 dog, and one son in college. In her previous lives she has worked for a newspaper, a hospital, a retail store and local political campaigns. Hoarding materials and ideas for years, she is now trying to bring them to life.